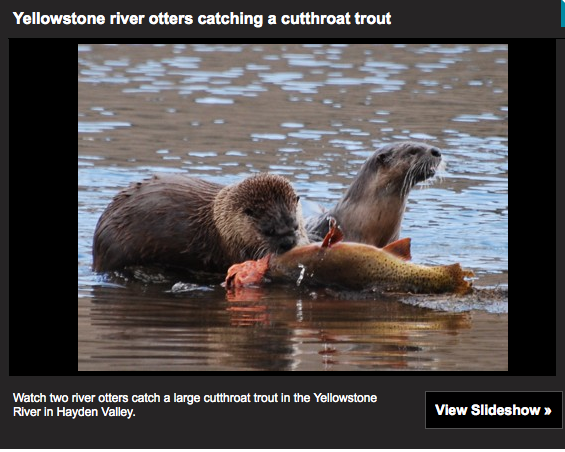 River otter eating a trout in Yellowstone National Park (photo by Beth Pratt)Although anglers in Yellowstone National Park have to practice catch-and-release when hooking the park’s native cutthroat trout, river otters fish under no such restriction. Much to the delight of a few dozen visitors, when two otters caught a sizable cutthroat trout in the Yellowstone River today they made an immediate meal of the fish on a roadside riverbank. Note: My expert sources say this might be a German Brown Trout--care to weigh in? One of the otters struggled with the mighty fish for about fifteen minutes—the trout did not yield without a fight (see a photo slideshow of the struggle below). Cutthroat trout are a keystone species in the park and provide a vital food source for a variety of other wildlife, including grizzly bears, osprey, bald eagles, pelicans, and weasels. Anglers must release the cutthroat as the fish faces a number of threats, most notable from competition with and predation by non-native trout. The Yellowstone River in Hayden Valley, where these two otters made their impressive catch, is prime cutthroat habitat—and as a result a good place for otters to frequent as well. River otters spin and swirl playfully in the park’s riverways, and can also be viewed in Yellowstone Lake. Although the animal is not very agile on land, it maneuvers deftly and quickly in the water and can swim at speeds of up to six miles per hour.